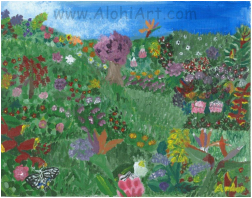 The name Alohi Art means bright art in Hawaiian. My pictures are inspired by the wonderful creation God has made and my goal is to share His Joy. Many of my paintings are from Maui where I lived for seven years. I am currently located in New Bern, NC. Psalms 40:16 But may the Joy of the Lord be given to everyone who loves him and his salvation. May they constantly exclaim "How Great God is!" ​My art is featured on the cover of boxes of truffles by Bellafina Chocolates, and I also have some of my note cards available in there gift shop. There chocolates are absolutely delicious, and it's for a good cause too. All Bellafina Chocolates net proceeds (after covering expenses) goes to help children in need! Try them out at www.bellafinachocolates.com. My painting of ﻿Apapane on Lehua was selected in to the Malama Wao Akua 2011's annual juried art exhibition. 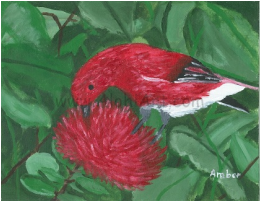 Apapane are native to Hawaii, and rely on the Lehua for its nectar. They mainly live in native forests ﻿on Maui, and Kaua`i. This painting of Jumping for Joy was selected into the Whale Foundation's juried art show in 2011. It also won a prize for the best in my age division. 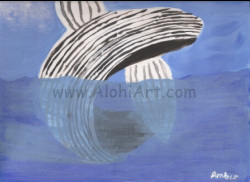 This painting is inspired by some of the whale watches I have been on. Nobody knows why whales jump. Some people think they do it for fun, but I think it’s because they’re so happy to return to Maui where they were born that they’re Jumping for Joy. This painting of Flowery Meadow was selected into to the Art Hui's juried gallery in 2011. I spent a lot of time on it. If you look closely you might see the grass path that goes from the bottom right corner to the top left. A lot of the plants in this picture are from my yard. My painting of Ilima flowers was accepted into Malama Wao Akua 2010's annual juried art exhibition. Only 54 pieces of art were selected from a record 153 entries. It was purchase by an artist from Oregon. The Ilima flower is native to Hawaii.